- This mission can only be trigged once you’ve defeated the Institute, one way or another. That said, it will only appear if you are at war with the Brotherhood for some reason. There are a few in-quest reasons this might happen, but the easiest way to get it done is to kill someone important. The most likely candidate is Elder Maxsom himself. 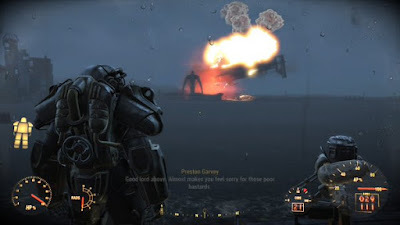 Assuming you’re a member of the Brotherhood, take a suit of Power Armor up to the Prydwen and, I dunno, shoot Maxsom in the face or something. Leap off of the airship in the Armor and you’ll land without damage, and you’ll be an enemy to the Brotherhood. The folks of Cambridge Police Station make good, probably easier targets, as well. Four Oil - Available from Paint Cans, Soaps, Oil Cans, Gas Cans, Blowtorches, etc. Four Screws - Available from Desk Fans, Globes, Toys, Typewriters, etc. Six Gears - Available in Cameras, Fishing Rods, Microscopes, Typerwriters, etc. Five Springs - Available from Alarm Clocks, Cameras, Fishing Rods, Handcuffs, etc. You can purchase the majority of these items from vendors - Trashcan Carla has pretty much all of this stuff on sale, for example, if you check her in Sanctuary - though a few visits to enemy-filled areas should yield the same results, with no money spent. Your call. - … and, as you watch the Prydwen burn, the Brotherhood will launch an assault on the Castle. EPIC. Prepare for Defend the Castle… aaaagain. I highly suggest reading the next section before attacking the Prydwen, as you aren’t given much prep time after the airship falls. Heeeeere comes the Brotherhood! This battle is absolutely brutal, and unless you have a punishing force of your own it will probably take a while. We dealt with Defend the Castle in this article, but since you’re given no time to prepare after the Prydwen goes down, I figure some tips here are a good idea. Have as many companions as you can manage in the Castle, whether they’re accompanying you or not. Same goes for Settlers. All should be well-armed. Set up tons - tons - of Turrets on the walls, facing into the courtyard. Keep them out of the middle of the Castle when possible, as the Brotherhood will drop soldiers from Vertibirds, and when the ships crash they’re more likely to fall on the grounds rather than the walls. If they land on your Turrets you’ll have to make repairs double-time. Bring armor-piercing weapons. Most of the Knights coming in have Power Armor. Bring your own Power Armor. Seriously. So much gunfire flies around this battle that you’ll want the extra defence, whether you normally use Power Armor or not. There are ten-plus rounds of Knights on the way, and each wave gets progressively tougher. Don’t be surprised if some Legendaries hop out of the Vertibirds. So long as you have enough guys on your side, though, winning is inevitable - it might just take a while. Feel free to run and let your dudes finish the work if the strain is proving too much. Once you ward off the Brotherhood in this battle, congrats! They’re gone! The Prydwen is removed from the game completely, you won’t see Vertibirds flying around anymore (that I’ve seen, anyway), and the radio will happily proclaim that you’re awesome. You’ll still see the Brotherhood hanging around the Cambridge Police Station, mind, but I’m sure you know how to deal with them.